Today the early risers from the FROG attended the first day of fieldwork at on the foreshore at Cannon Street, in the City of London. This is a site we’ve been visiting regularly with guided walk groups over the years, and we first undertook fieldwork there during a rainy few days in May 2013. A team of FROGs has also been monitoring at the site since April 2013, focusing particularly on the fast eroding area at Swan Lane. 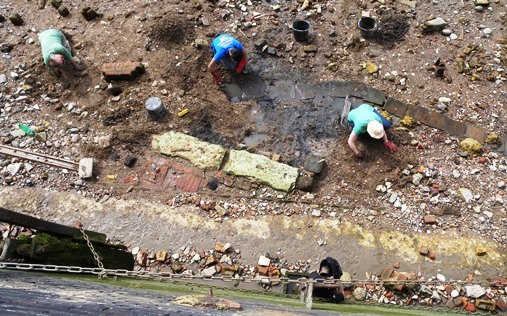 This morning we decided to focus our efforts on one of the better preserved sections of the foreshore, in between All Hallows Stairs (now a vertical ladder) and Swan Lane. 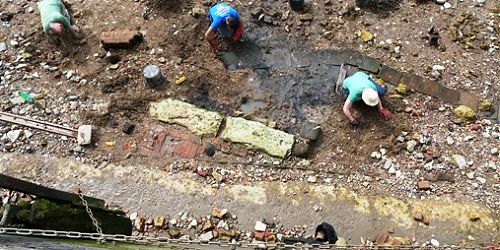 We were cleaning up timber piles and the remains of brickwork and masonry, together with much discussion as to what we thought might be going on. 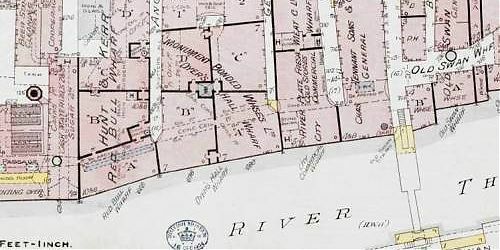 After much contemplation we think we have revealed evidence for a riverside wall, predating the present waterfront defence, and lying on a different alignment. 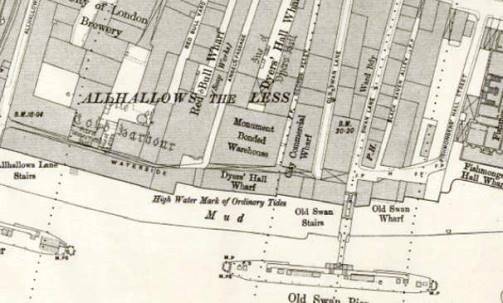 Map regression work undertaken by FROG member John Layt provides support for this hypothesis: comparison of the 1896 Ordnance Survey map with the 1904 Goad plan show a clear realignment of the riverfront at Red Bull Wharf during this short period of time. 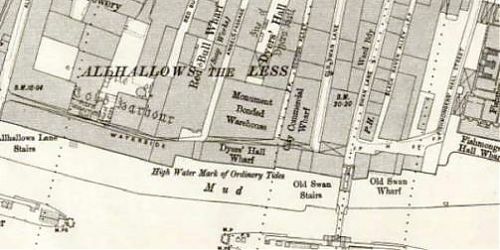 It may be that the timber piles lying to the south of the surviving brick and masonry of the 1890s wall represent an earlier waterfront (possibly that shown on the 1875 OS plan). 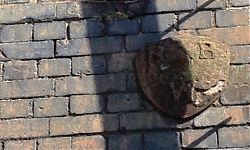 Further evidence for the identification of the site as Red Bull Wharf also survives in the form of metal plaques embossed with ‘RBW’ attached to the wall itself. All in all, a very interesting morning’s work! 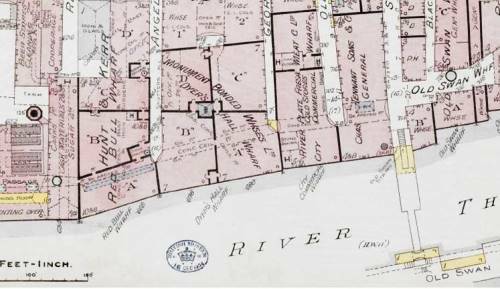 We’ll be working at Cannon Street all week and look forward to learning more about this part of the City foreshore as part of the London’s Lost Waterways Project.